Tom Watson was pheasant hunting in South Dakota when he got the call for which he had been waiting nearly two decades. 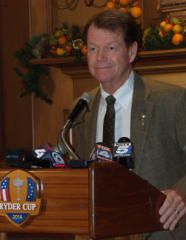 The Kansas City professional golf legend, winner of eight major championships, has been named captain of the 2014 United States Ryder Cup Team. Ted Bishop, president of The Professional Golfers’ Association of America, made that phone call to Watson back in November 2010 to discuss the possibility of his leading the U.S. team for the second time. Watson was happy to accept the offer that came after a formal interview. Watson guided the U.S. team to victory in 1993 at The Belfry in Sutton Coldfield, England, the last time it won the Ryder Cup in Europe. Watson is the first repeat U.S. captain since Jack Nicklaus in 1987 and the seventh U.S. golfer to serve more than one term as Ryder Cup captain. Watson will lead a 12-member team in the 40th Ryder Cup, Sept. 26-28, 2014, at the PGA Centenary Course at Gleneagles in Perthshire, Scotland. 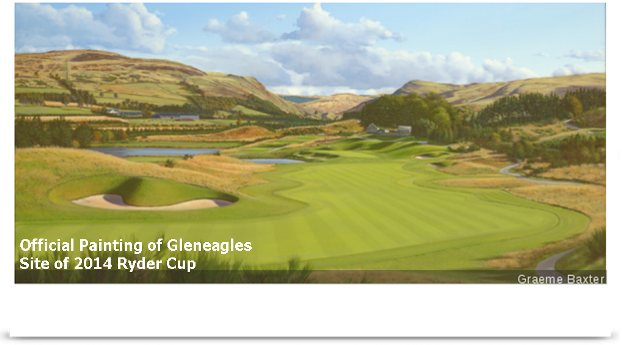 It will be only the second Ryder Cup to be held in Scotland, the birthplace of golf. The Europeans have won seven of the last nine biennial Ryder Cup matches, including at Medinah Country Club near Chicago last September. After the official announcement was made on Dec. 13 with what Watson called a “big splash” news conference at the Empire State Building in New York and an appearance on the NBC “Today” show, Watson returned home to Kansas City to meet with local media at a news conference on Dec. 19 at the Kansas City Country Club. Standing amidst Christmas décor while behind a podium bearing the Ryder Cup 2014 logo, Watson discussed his thoughts on being tapped for this honor. About 20 local media and interested parties attended the news conference. “Now the journey begins to 2014, and we’ll see if we can change the course of events for the American team,” Watson said, acknowledging that the outcome of the Ryder Cup event last September was “heartbreaking for me.” The U.S. team gave up a four-point lead on the last day of the match. Watson pointed out that “the tables were turned from ’99, when the U.S. was four points behind going into the last day,” and prevailed. Noting that momentum can change quickly within Ryder Cup matches, Watson said, “The pressure in the Ryder Cup is unlike any pressure in any other event, both as a captain and a player.” But Watson is used to that pressure and ready to take it on again. Watson sees his captain’s role as being that of a stage manager who creates a framework in which the team can be successful. “The captain sets the stage, gives players a few cues and the players have to go out and perform,” he said. According to Watson, his job will be to eliminate distractions during the tournament week to allow the players to get rest, and to put the best players out there by determining who is playing the best at that time. All that matters is for the Ryder Cup team members to trust him to make the right decisions for the team, Watson said. He will choose four assistant captains for the team sometime in 2014. They will act as his “eyes and ears” to assess how the players are playing. Most of the players for the U.S. Ryder Cup team will be determined through a qualifying process. After that is completed, Watson will choose two to four additional players shortly after Labor Day 2014. He said the PGA will compile player statistics for him to use in determining his player picks. “I’ll be watching – particularly to see how they play in bad weather,” Watson said. The European team will have an advantage because their players will have played Gleneagles many more times than the U.S. team will have, according to Watson. “When you play it more, you get the different weather conditions and wind factors. (Without that experience) you may err because of the strength of the wind on any given hole,” he said. Asked to compare this Ryder Cup with the one in 1993, Watson noted that there are more distractions for players now and that his responsibilities are greater this time in terms of promoting the Ryder Cup for the PGA. In 1993, nothing started until the year of the Ryder Cup, he said. Watson competed on four U.S. Ryder Cup Teams (1977, 1981, 1983 and 1989) that won three times and tied once, compiling a 10-4-1 individual record. Inducted in 1988 into the World Golf Hall of Fame, Watson holds 70 worldwide professional championships since becoming a tour professional in 1971. His eight major titles include five Open Championships (1975, 1977, 1980, 1982 and 1983), two Masters (1977 and 1981), and the 1982 U.S. Open. Since joining the Champions Tour in 1999, Watson has won 14 times, including the 2001 and 2011 Senior PGA Championships among six senior major titles. The Ryder Cup began in 1927 when English seed merchant Samuel Ryder commissioned the casting of a gold chalice that bears his name. The U.S. Team defeated Great Britain, 9 ½ to 2 ½, in the inaugural matches in Worcester, Mass. 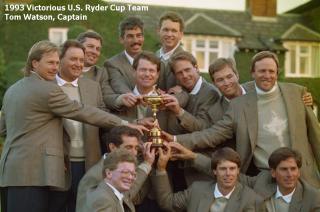 Since then, except for a span (1939-45) during World War II and following the Sept. 11, 2001, attacks upon the U.S., the Ryder Cup has been held biennially with the U.S. and Europe alternating as host. The U.S. dominated the Ryder Cup for many years, Watson pointed out. The competitors were just from the U.S. and Great Britain until 1979, when Nicklaus suggested including other European players to make the event more competitive, he explained. “The competition really got hot” after that, Watson said. For Watson, it means a lot to represent his country in the Ryder Cup, whether as a player or as captain. “It is a thrill to see the U.S. flag go up at the opening ceremony. You’re playing for your country,” he said.